In a series of linked stories, fourteen crime authors tell the story of a disastrous night in one town. The Night of the Flood is a dark, disturbing book with an open-ended conclusion that allows readers to imagine what might have happened after. The town of Everton, Pennsylvania was warned. Maggie Wilbourne had been found guilty and sentenced to death for killing the two men who raped her. A secret group of women from Everton, calling themselves "The Daughters" promised they would blow up the dam and flood the town if Maggie was executed. Just minutes after her death, they followed through. It was a night to live in infamy, as the poor and beaten down took their revenge. The resulting chaos and violence affected everyone in town - from the wealthy whose homes perched above the floodwaters, to businesspeople, the police and The Daughters themselves. It wasn't just looters who took advantage of the darkness and lawlessness that night. Spouses, children, strangers took their opportunities to right perceived wrongs. The gritty, intense compilation may be a source of discovery for some readers. Most of these authors who wrote the dark stories are not as well-known as other thriller writers. While readers may recognize names such as Jenny Milchman, Alan Orloff, Hilary Davidson, there are other writers whose noir stories stand out in this book. J.J. Hensley's "The Copy Man" was one of my favorites, with the unusual voice of the narrator. Gwen Florio's "Marta" also stands out. But, every one of these stories served to tie the collection together. The Night of the Flood is an unconventional, action-packed novel. If you don't mind a disturbing, gritty collection, try this one. 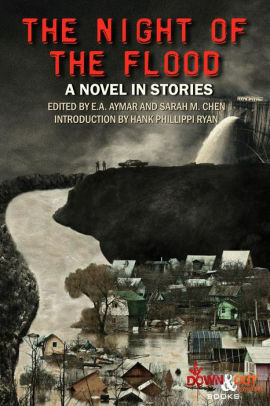 The Night of the Flood edited by E.A. Aymar and Sarah M. Chen. Down & Out Books, 2018. ISBN 9781946502513 (paperback), 318p. FTC Full Disclosure - I received this to read for a journal. It is interesting, Kay. And, some characters reappear in stories by other authors. The book flows nicely - ha, flows. Thanks for the review! We are glad you enjoyed it. Sounds creepy, dark and very intriguing. Just bought it on Amazon.